Spring Break 2013 started with a Big Easter Bang and ended with Big Book News. Not much beats a family gathering with lots of delicious food. And what does a historical fiction author take to Easter potluck? 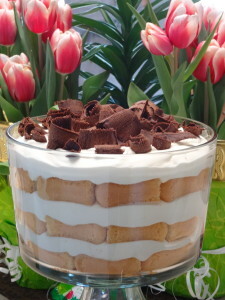 Dessert with a history stretching back to seventeenth century Italy; a Tiramisu Trifle! As part of the This Writer’s Life category on my blog, I’m posting the recipe today. I promise it’s easy, because This Writer has kids and a nursing career and a house and there are just limits to what one woman can accomplish in a day! Now bear with me while I attempt to scrub out all mentions of the old title in previous posts. And update Twitter, Goodreads, Facebook, my website, third cousins, and my mail carrier. Whew! All this excitement calls for celebration with another Tiramisu Trifle! Layer the bottom of your trifle dish with lady fingers (I halved mine to get the edges closer to the curve of the dish). Brush espresso over the lady fingers (or use a turkey baster – the spongy cookies absorb liquid well). Stir half of the sugar and mascarpone cheese in a bowl. In a separate, chilled bowl, whisk heavy cream and the other half of the sugar together until stiff peaks form. Fold the cheese mixture into the cream mixture. Proceed to layer this mixture with the lady fingers (adjust according to the size of your dish, mine held three layers of each). Don’t forget to brush each layer of lady fingers with espresso. End with a cream layer and top with chocolate curls. Refrigerate until time to serve. Enjoy! Melt chocolate chips in the microwave in 30 second intervals. Spread into a thin layer on a cookie sheet and allow to harden. Use a metal spatula to scrape the edges of the chocolate away from you to form curls (this takes some practice, but even if it just flakes it will be pretty on top of the cream). Historical cosmetics lovers, have no fear. My spring break travels took me to a wonderful museum exhibit in Cincinnati that I’ll share with you soon. Photos of ancient cosmetic containers may even be included! Just wanted you to know, I have watched from afar through your mother’s eyes as you went through the many steps to publishing. I have worked with her for a long time. She is a jewel. So happy for you, and I love the new title for your book. Wishing you many more years of success. Joy, I am so touched by your note! My mother has been an integral part of my publishing journey and knowing you’ve shared the steps with her is very special! Thank you from the bottom of my heart!! Love it!! Only 10 more months!! Love your novel’s new title, Marci! Oh I’m so glad, Karen! Thanks so much!! That is amazing news!! It sounds as delicious as the tiramisu!! So happy and excited for you, and can’t WAIT to see it grace the bookshelves!! Thanks so much, Janet! I’m just over the moon about it! Leave a Reply to Joy Gibson Click here to cancel reply.